The Siskiyou Mountains of southern Oregon and northern California are what writers of stories of the west, both historic and fictional, call “rough country.” It is in fact about as rough as anyone might ask for in the lower 48 states, particularly in the steep tangled chasms of the Kalmiopsis Wilderness at the western end of the complex. The whole region has in recent years become a land in transition as its history of winter snows is now matched by summer fires of brutal proportions. Like every poem in this highly local collection, “The Border” is linked to a specific site, Soda Mountain. The entire collection was written on-site and there is a definite sense of immediate experience and hands-on knowledge in most of them. The great poet of human experience J. D. McClatchy once wrote that the natural world is an “uncongenial” source for poetic inspiration. Setting aside the fact that nature is, as Gary Snyder put it, home, not a foreign place, I can’t help but doubt whether congeniality makes for the best poetic experience. This collection stands for the primacy of what is rooted in the ground, as does the work of Pattiann Rogers, Mary Oliver, Loren Eiseley, and others. Before winter opens its empty hands. Let’s unpack this characteristic Trail poem and see what’s in it. First, it is profoundly regional in the sense that the presence of Oregon grape and manzanita in the same place breathes of the collision-space of the moister climate of the coastal northwest with the more sere shrub-forests of California. Then it is about as seasonal as a poem can be, clearly written on or near the autumnal equinox (set forth where it should be, halfway through the poem). We digest (pardon the expression) an evocatively restated outline of recent seasons. Then the poem, which has to this point been an amiable, detail-rich meander on a ridgeline filled with fruit-nibbling birds, ends with the oxygen-sucking hammer fall of what winter really means in the high country: death. This bold tonal shift in the last line changes the meaning of every previous word: all this cheerful chewing is not a casual avian picnic. It is a desperate bid for continued life by way of energy-hungry migration. There is some variation in craft and weight among these poems, but the best among them are very good indeed. A review should not reveal all the goodies, of course, as readers should read the real thing, but I’ll mention “False Hellebore,” “To a Young Lizard,” and “Late Riders” as among the most fully realized and thoroughly carved of the collection. The worth of all the time there is. 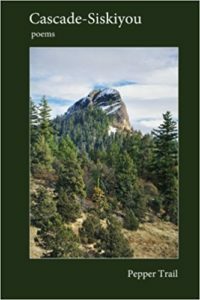 I am told that Pepper Trail was named the official poet laureate of the Cascade-Siskiyou National Monument in 2013. And why not? Alan Contreras is author of the poetry collections Night Crossing and Firewand. His collection In the Time of the Queen will appear in 2018. He is co-editor of Birds of Oregon (OSU Press 2003), author of Afield: Forty Years of Birding The American West (OSU Press 2009), Northwest Birds in Winter (OSU Press 1997), State Authorization of Colleges and Universities and other titles. He is editing a collection of essays about Malheur National Wildlife Refuge and will soon begin work on a history of Oregon ornithology. He is a graduate of the University of Oregon and lives in Eugene.